I went to the DA last week. When you enter, you are greeted with flyers from UFT Unity, New Action and MORE. Sometimes I read them. Sometimes I do not. Last week I had other business and tossed them out as I exited. 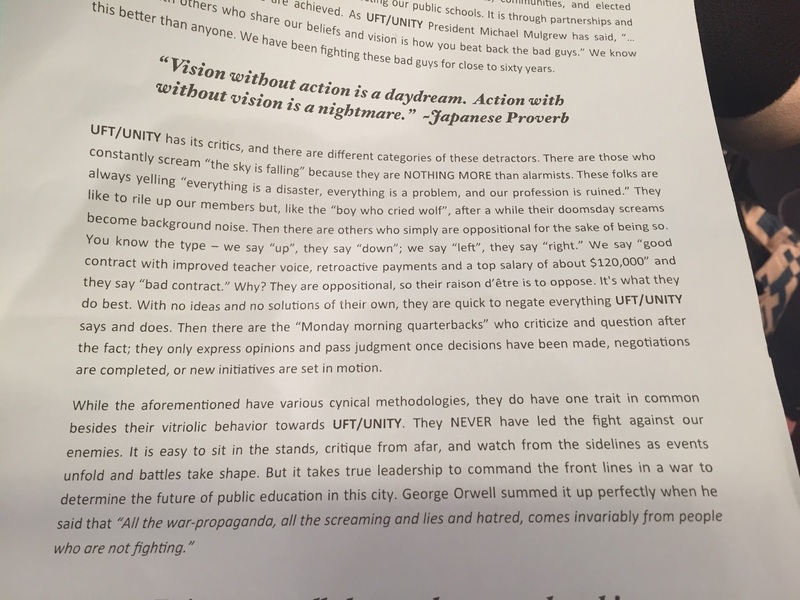 But someone sent me a scan of the Unity flyer last week. It portrays all those who dare question Punchy Mike Mulgrew as contrary imbeciles shouting, "The sky is falling." It speaks of the contract Mulgrew negotiated but somehow forgets to mention that UFT members don't actually get the money until over a decade after most city workers did. It neglects to mention the second-tier due process it negotiated for ATR teachers, or the fact that several of them have lost their careers for the offense of not reporting to interviews of which they may or may not have even been aware. It neglects to mention the fear and loathing that pervades our ranks since Punchy Mike negotiated the current APPR. Forget about the impending draconian version for which he thanked Andrew Cuomo's Heavy Hearts Club Band. The pamphlet harps on the fact that Unity opponents have never been in control. This is interesting, by way of non-comparison. In fact, Unity, in this very handout, is striving to make sure they never gain control. It's ironic to hear them complain of their very success. But this is the sort of rhetoric you get from the visionaries who failed to recognize Cuomo as an opponent until a full five years after he announced he was going after union. One reason opponents have never been in contol is that Unity has taken many steps to ensure its iron-clad monopoly. It keeps the faithful that way with loyalty oaths it exchanges for free trips to conventions and patronage gigs. And while I know some very smart people who work for the union, I've also encountered people who clearly aren't smart at all, just along for the ride on the gravy train. As a high school teacher, it's insulting that we alone are not trusted to elect our Vice President. As a chapter leader, it's insulting that we aren't allowed to elect our District Rep. It's a fact that more retirees than active members voted in the last election. It's a fact that Unity maintains a UFT office in Florida from which non-teachers like Michael Mulgrew can campaign, and from which working teachers who might oppose him cannot. And while Unity accuses its opponents of cynicism, it's a further fact that fewer than 20% of working members found it worth their time to vote in the last election. If there is cynicism, it's certainly engendered by UFT Unity policies. Here's a fact--it's no fun opposing the Unity juggernaut. It's no fun being excluded from every single decision made by the union. I am an activist, and I would love nothing more than working with leadership to make things better for members. Unlike Punchy Mike Mulgrew, I'm in school every day, I see kids every day, and I hear the voices of working teachers every day. That's what motivates me. Unlike a whole lot of Unity faithful, I am not motivated by free trips or patronage jobs. That's why I cannot support charter schools, mayoral control, junk science teacher ratings, two-tier due process, erosion of seniority privileges, collusion with Bill Gates, contracts clearly inferior to those of our brother or sister unionists, or dumping the worst pattern ever on those same brothers and sisters. I want what's better for working people, not what's convenient for me or Punchy Mike. UFT Unity assumes its readers to either have signed the oath, drunk the Kool Aid, or more likely, to be utterly ignorant of every demonstrable fact on this blog. If that isn't cynical, I don't know what is. It's disappointing that this is the best argument they can muster--reheated nonsense rendered even more baseless with every concession they embrace. To judge from this piece of paper, you'd think working conditions were minor technicalities. Talk to someone who lost his job for not showing for an interview. Talk to someone facing job loss via Mulgrew's APPR. Talk to someone whose rating got dragged into the gutter by junk science VAM. Talk to an ATR teacher who got discontinued for no reason whatsoever. I can only suppose the person who wrote this pamphlet talks to none of these people. 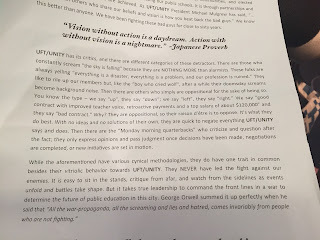 I talk to all of them, someone has to represent them, and this pamphlet makes clear it is not UFT Unity.